However, floral arrangements for winter-themed events can be a bit challenging. While there are hothouse varieties available in some areas, fresh flowers can be quite difficult to source locally during the colder months. This is part of what makes artificial arrangements an alternative for winter weddings. Whether you choose real or artificial flowers for your wedding, the style of the arrangements is the most crucial detail to sort out. The color of your flowers will help coordinate or contrast with other decor and key elements like bridesmaid dresses. And while winter wedding flowers have a specific style to them, the season isn’t restrictive in terms of the colors you can use for your arrangements. The hues that you go with, the way you combine them, and what you accent them with will determine the wintery look. That being said, most people refer to wintery colors as either a palette of frosty, light shades or a darker, deeper set of jewel tones. These palettes reflect the state of nature in glittery, icy tones as well as the deep hues that are often seen in winter foliage and berries. 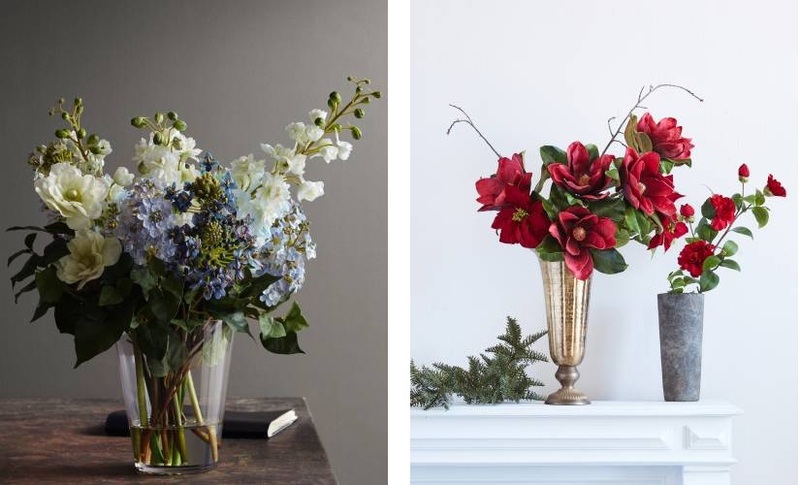 No matter what theme you’re going for, if you anchor your floral arrangements around these color palettes, they will look seasonally appropriate. Eucalyptus branches offer elegantly shaped leaves that work well as part of a bouquet or centerpiece. The white edges add an almost frosted look and the subdued color palette allow it to play a supporting role to the central blooms in the arrangement. Cedar or Fir boughs are a classy way to add a woodsy charm to any arrangement and offer a subtle nod to the holiday season. Holly may sound a bit more Christmasy than other options, but it comes in different varieties that can be lovely in winter floral arrangements. Japanese Holly offers the same glossy leaves as traditional Christmas Holly but with rounded edges. Alternately, Blue Holly maintains the signature shape of pointed leaves, but grows in more subdued blue-green shades and isn’t quite as shiny. You can also incorporate wintery elements into your flower arrangements with floral picks and sprays. These are simple ways to instantly add a bit more of a festive touch. 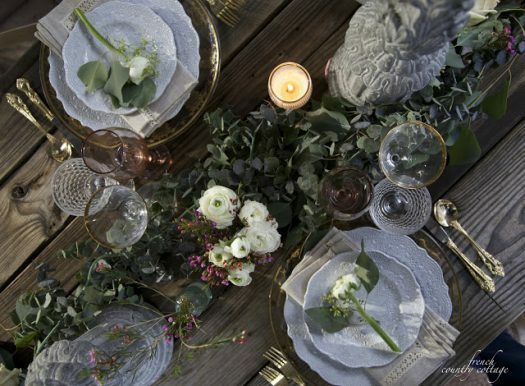 Add metallic accents such as gold, silver, or even copper covered foliage to give an arrangement a bit of sparkle and to complement your color palette. You can also accent with icy blues or purples to lend your flowers a frost-tinged look. Create a charming scene with flowers and accents inspired by glittering snowy days, blooms in rich and sumptuous hues, or elegant Christmas arrangements to celebrate the love that made the occasion happen in the first place. Visit Balsam Hill for more winter-themed decorations and foliage.